Isolators (Disconnectors) of Voltage rating 12KV to 245KV & Current rating up to 3000 Amps. Manufacturing & Supply of Support Structures for Isolators are also undertaken as per client requirements. The double break Isolator (Disconnectors) is provided with high pressure releasing arrangement. Earthing Swithes are also provided as per client requirement. Line / Distribution Transformer Sectionalisers /Horn Gap Fuses /Drop out Fuses for rural electrifications of 12KV & 36KV are also manufactured. (b) Manual operation; through reduction gear boxes. (c) Manually operated through levers. Auxiliary switches with requisite number of NO & NC contacts are provided. Requisite mechanical and / or electrical interlocking is provided. 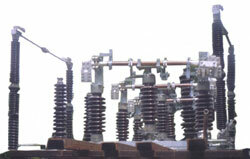 Insulators manufactured by reputed Insulators manufactures are also supplied as per client requirements.